Yu-Kai Lai participated in the conference MicroTAS 2018. It is a prestigious professional conference for reporting research results in microfluidics, microfabrication, nanotechnology, integration, materials and surfaces, analysis and synthesis, and detection technologies for life science and chemistry. The Conference offers plenary talks as well as contributed oral presentations and posters selected from submitted abstracts. This year there were over 900+ worldwide scientists and professionals engaged in research on and the use of integrated microsystems and nanotechnology for chemistry and life sciences. 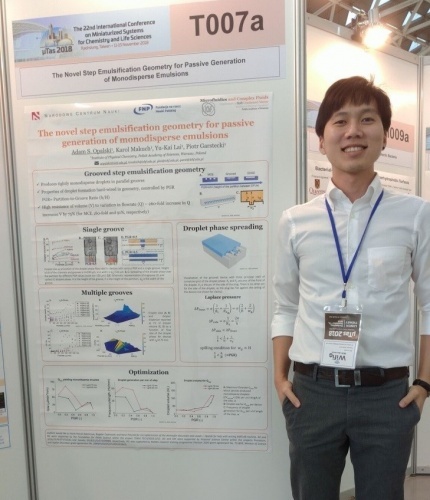 Yu-Kai Lai presented an co-authored poster, namely “The novel step emulsification geometry for passive generation of monodisperse emulsions”. During the conference, Yu-Kai was able to meet other outstanding researchers in his field, engaging in an inspiring discussion. Hence, Yu-Kai obtained scientific experience in terms of new research topic, networking and communication.